AUBURN, Maine, July 18, 2017 (GLOBE NEWSWIRE) — Today, Smithfield Foods’ Helping Hungry Homes® initiative, a program focused on alleviating hunger and helping Americans become more food secure, joined forces with Shaw’s to donate more than 35,000 pounds of protein to Good Shepherd Food Bank. The donation, equivalent to more than 140,000 servings, will help families fight hunger across Maine where one in seven individuals are food insecure. Smithfield’s donation to Good Shepherd Food Bank was a part of the Helping Hungry Homes® 2017 nationwide donation tour. 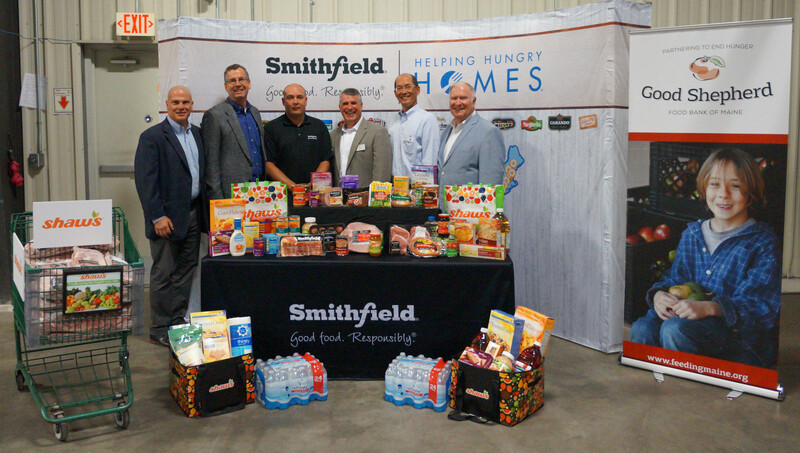 Throughout the annual tour, Smithfield will provide large-scale protein donations to nearly 60 food banks across the country. This donation adds to the more than 65 million servings of protein donated since 2011. Following today’s event, Helping Hungry Homes® will visit Florence, South Carolina Thursday, July 20. For more information about Helping Hungry Homes® and a list of upcoming donation events, visit helpinghungryhomes.com. As the largest hunger relief organization in Maine, Good Shepherd Food Bank provides for Mainers facing hunger by distributing nutritious food to more than 400 partner agencies across the state, including food pantries, meal sites, schools, and senior programs. Together with its network, the Food Bank leads a statewide effort to combat the root causes of hunger by engaging in advocacy, nutrition education, and strategic partnerships. In 2016, the Food Bank distributed 21 million meals to families, children, and seniors in need throughout Maine. Website: www.feedingmaine.org; Phone: (207) 782-3554; Facebook: www.facebook.com/feedingmaine; Twitter: www.twitter.com/feedingmaine. Shaw’s and Star Market are working to become the Favorite Local Supermarket™ in every state in which they operate. Shaw’s is one of the oldest continuously operated supermarkets in the United States with its roots dating to 1860. Star Market, a premier food retailer, has been serving Boston area customers since 1915. Throughout the five New England states, there are 153 Shaw’s and Star Market store locations employing approximately 19,000 employees. For more information about Shaw’s and Star Market, please visit www.shaws.com and www.starmarket.com or connect with us on Facebook at https://www.facebook.com/starmarket or http://www.facebook.com/Shaws.